I love this natural liquid hand soap, great scent, not too bright, not too soft, it cleans and lathers well. 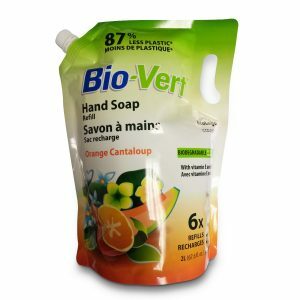 2L refill is awesome, ask any of your stores that sell Bio-Vert to add this product. If they won’t add it on the shelf, they will often order it in just for you (even chain grocery stores, not just boutique or health food shops)! I loathed having to purchase other natural products in pump containers and have all that packaging only to be put back in the recycling bin. Love love love the refill bag! Made in Canada! It’s closer to us, just one province over in Quebec. See ingredients on their website – seems to be gluten free and vegan.